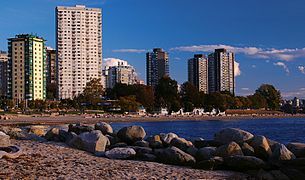 English Bay Beach, near the city's West End residential neighbourhood, is the most popular sunbathing, swimming, and sunset-watching beach in the downtown Vancouver area. 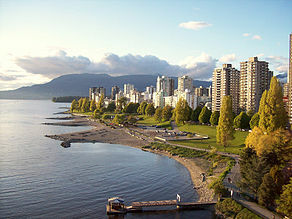 Other downtown beaches facing English Bay include Sunset Beach, Second Beach, and Third Beach. 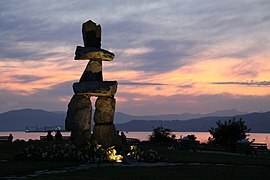 Along the south shore of the bay lie Kitsilano Beach, Jericho Beach, the Spanish Banks beaches, and Locarno Beach, while on the North Shore are Ambleside Beach and various smaller cove-beaches in the city of West Vancouver. English Bay beaches are all major tourist attraction to visitors all year long, with the peak season being late summer. 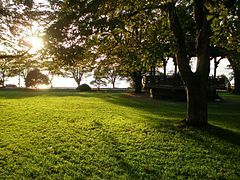 English Bay Beach is host to a number of public events. The Celebration of Light is a fireworks competition that is held for two weeks every summer (usually the last week in July and first week in August). While this competition often struggles to secure funding, it has successfully run since 1990 and is the largest off-shore fireworks display in the world. Each winter it is the host of Vancouvers' annual Polar Bear Swim and each summer the Vancouver Pride Parade and Festival is held on English Bay Beach. In the late 19th and early 20th centuries, English Bay Beach was home to Vancouver's first official lifeguard, the legendary Joe Fortes, who taught hundreds of the city's early residents how to swim, and patrolled the beach from his cabin on its shore. Today, the waters of the bay are often dotted with hundreds of small pleasure boats, as well as huge freighters waiting at anchor to load cargoes at Vancouver's port. The beach was the site of an oil spill in Vancouver on April 8, 2015. The official cause of the spill has not been confirmed, but at least 2700 litres of "bunker fuel" are known to have escaped from a cargo ship into the bay. The highly toxic oil later washed up on nearby beaches, creating a slick 15–20 cm thick. At least twenty seabirds were injured or affected by the spill, but the full extent of any environmental and economic damage is unknown at this early stage. The federal government was criticized for its response to the spill, including the delay in notifying the public of the health hazard, by the mayor and premier, environmental scientists, and an international shipping expert. Coast Guard officials defended the response, with regional director Assistant Commissioner Roger Girouard saying, "it was exceptional". The beaches were tested and most were reopened following a ten-day closure. While the water and soil at most of the beaches tested was found not to have harmful levels of oil present, the government cautioned that "small amounts" of oil may remain, and urged people to be aware of the possible hazard and avoid contact with any oil. The reopened beaches will continue to be tested and the need for further cleanup assessed as needed. Looking along English Bay Beach in the West End. ^ "BC Geographical Names". apps.gov.bc.ca. Retrieved 9 August 2018. ^ "Oil slick reaches West Vancouver's Sandy Cove". Cbc.ca. Retrieved 9 August 2018. ^ "What is bunker fuel? - CBC News". Cbc.ca. Retrieved 9 August 2018. ^ Howell, Mike. "Vancouver oil spill might be bigger than expected". Vancourier.com. Retrieved 9 August 2018. ^ "True costs of Vancouver oil spill will be far reaching: expert - CBC News". Cbc.ca. Retrieved 9 August 2018. 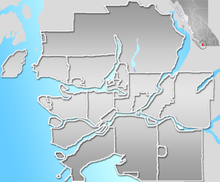 ^ "Oil spill response by coast guard blasted by Vancouver mayor, B.C. premier". CBC News. April 10, 2015. ^ "Was the response to the Vancouver fuel spill fast enough? - CBC News". Cbc.ca. Retrieved 9 August 2018. ^ Mackin, Bob. "Feds on the offensive over English Bay fuel spill". Vancvourier.com. Retrieved 9 August 2018. ^ "Most Vancouver beaches have now been re-opened following the fuel spill". News1130.com. 19 April 2015. Retrieved 9 August 2018. "English Bay". BC Geographical Names. 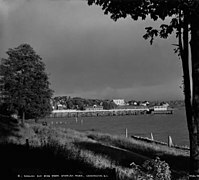 Wikimedia Commons has media related to English Bay.